Our Pilates Principles Course curriculum provides new participants an individualized opportunity to build a strong foundation of the Essential Level STOTT PILATES® repertoire. It is the mastery of these fundamentals that integrates proper technique and neuromuscular firing patterns to achieve the optimal results Pilates is known for. Once that base is built, movements naturally become fluid and coordinated. This allows for the addition of the next level of exercises which include elements of balance, coordination, control, and intensity which can be learned in a group class, or continued private setting. 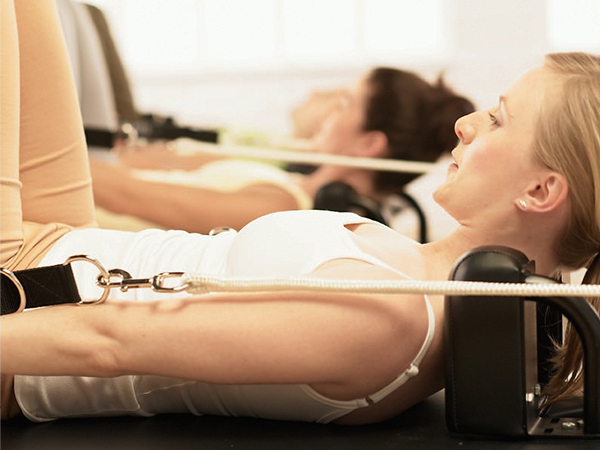 Aspire Pilates Training Center specializes in individualized instruction throughout all of our training settings. This focused attention is found in both group classes and private training sessions. If private training is preference for our clients, we offer private and semi-private (two participants) options. We also provide the interactive opportunity of Group Pilates Classes. We also offer a Pilates Refresher Program design for individuals with various Pilates background experience, that need orientation to the STOTT PILATES principles and additional equipment.